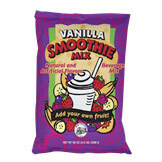 Description: Vanilla smoothie mix, add fresh fruit and juice and make your own delicious smoothies. Certifications: BRC Certified, Kosher-Dairy Certified. Buy High Quality Smoothie Mix at Wholesale Prices!